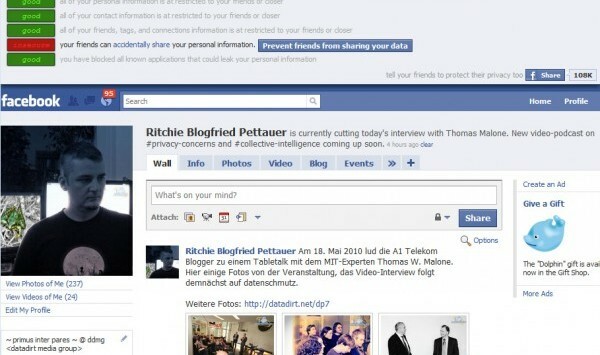 Concerned about your Facebook privacy? Back in the 90ies, more than a dozen search engines fought for the user's attention. A couple of years later (almost) only Google was left. Do we face a similar development in the field of social networking? Taking a look at the latest Facebook figures, I'm inclined to answer this question with yes. Yet their ever-growing social graphs make more and more users nervous, and even though Facebook in my opinion is doing a good job giving the user control over his content, Reclaimprivacy.org might come in handy. Fearful user might suspect some phishing action going on here – but fear not, the tool is open source, so code-savy folks can take a look or even contribute. The scanner offers no new functionalities – basically, it's just a central view of all of Facebook's privacy settings. In other words: use with caution. Don't forget you're on Facebook to communicate in the first place. And by the way: technical glitches happen all the time, new bugs give programmers a headache. Plus nobody likes a bully, so the safest strategy is not to post any offensive material on Facebook – just keep that in mind and you're pretty much in the clear, even without the help of Reclaimprivacy.org. 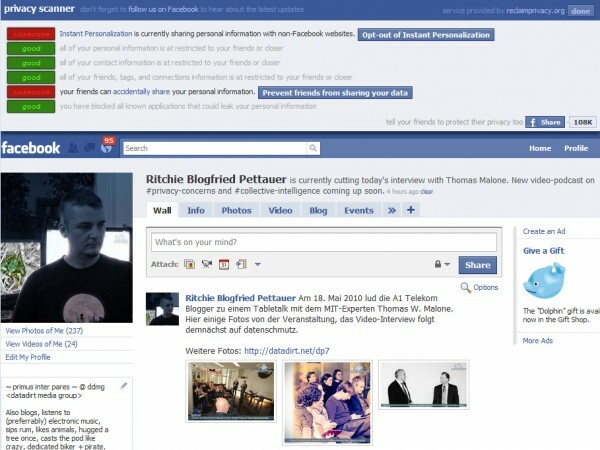 https://datadirt.net/wp-content/uploads/2013/04/reclaimprivacy-600x450.jpg 450 600 Ritchie Blogfried Pettauer https://datadirt.net/wp-content/uploads/2015/02/datadirt-logo.png Ritchie Blogfried Pettauer2010-05-19 00:07:352010-05-19 00:07:35Concerned about your Facebook privacy?